Visit some of the most beautiful spots in the UK on this wonderful day trip leaving from London Victoria. We arrive early at Windsor Castle in order to beat the queues that form in Summer, for our visit to Her Majesty The Queen’s favourite weekend residence, the impressive Windsor Castle. Just outside London and a royal home for the past 900 years, wander through the breathtaking State Apartments which include art works by Leonardo Da Vinci and Rembrandt. Visit St George’s Chapel, the resting place of Henry VI and see Queen Mary’s Dolls House. 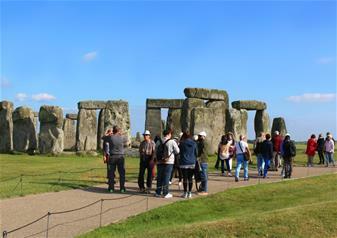 Visit one of the most mysterious spots in the UK – the magical Stonehenge. The impressive rock formation has stood for the past 5,000 years and their purpose is still hotly disputed to this day. Explore the stones, learn about the history in the visitor centre and make up your own mind! See Lacock Abbey in Lacock, a beautiful medieval village that is mentioned in the Domesday Book. The Abbey, in the middle of the village, is a quirky country house that was built on the foundations of a nunnery. After your visit to Lacock,head to the final location of the day. Visit the stunning city of Bath, the first city in the UK to be designated a UNESCO World Heritage Site. Take a 30 minute walking tour, seeing some of the highlights of the city centre and learning about Bath’s rich and colourful history from your experienced and friendly guide. Estimated arrival time back in London is approximately 8:00pm.